How do I earn the Bovada Poker bonus? 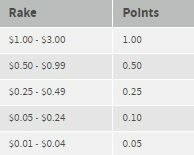 How do I earn Bovada Poker Points? Bovada is one of the biggest names in online gambling. Bovada welcomes U.S. players, and the brand encompasses a full-featured casino, sportsbook and poker room. In this review, we’ll take a closer look at the poker service, including the welcome bonus, the rewards program and the features that set it apart from other online poker rooms. You can click here to visit Bovada Poker. Bovada welcomes all poker players into the fold with a welcome bonus worth as much as $500. All you have to do to claim the bonus is be a first-time customer who joins Bovada by registering a new, valid account. Then, make a deposit. The minimum deposit at Bovada is $20. The bonus available to you will be equal to that amount, so if you deposit $20, you’ll have a $20 bonus available, and if you deposit $500 or more, you’ll have the maximum bonus of $500 available to you. Finally, download and install the Bovada poker client for Windows, Linux or Mac. Run the client, and begin playing your preferred style of poker. That’s all there is to it. There’s no need to use a code or lock in the bonus because poker bonuses work differently than casino bonuses. The house doesn’t give you the bonus all at once but rather doles it out to you pre-cleared as you play hands in cash games and tournaments. Note that this bonus is the same regardless of your chosen payment method. Bovada does offer a Bitcoin-specific bonus but that currently only applies to the sportsbook and casino and cannot be used at the poker room. Whenever you claim a poker bonus at Bovada, that money is available to you but not automatically awarded to you, you must earn the bonus money. In addition, a claimed poker bonus will only be available for a set period of time. In the case of the welcome bonus described above, that period is 30 days. Therefore, if you deposited $50 and claimed a $50 bonus, you’d have 30 days to claim that $50. At the end of that period, you’d keep what you earned but forfeit any outstanding bonus. 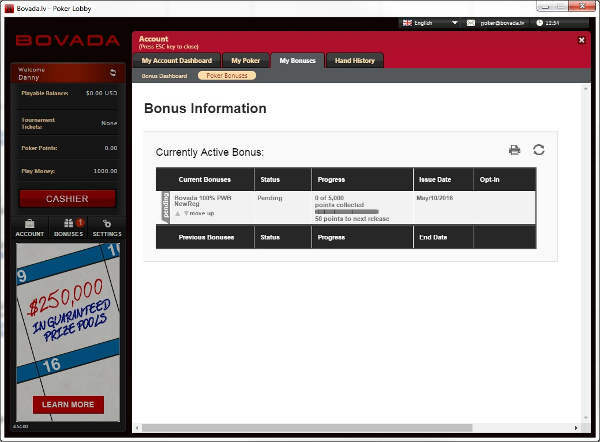 In the Bovada poker client, you can examine your active poker bonuses at any time, and the user interface will display the total size of the bonus, how much of the bonus you’ve earned, how much of the bonus is outstanding and how long you have left to claim the remaining bonus. The house doles out your poker bonus over levels, and there can be as many as six levels depending on how big your available bonus is. Your current level is based on the Poker Points you’ve earned. Poker Points or PP are a rewards/loyalty currency that we’ll discuss in more detail in an upcoming section. For now, all you need to know is that you earn PP each time you participate in a cash game or pay a tournament fee. Note that PP aren’t consumed during the process of clearing your bonus; they’re just used in this context to measure your participation. At 15 PP earned, you are at level one and receive $5 in bonus money. At 85, you are at level two and receive $20 or whatever you have remaining. Then, it’s $25 at 185; $50 at 500; $150 at 1,500; and finally, $250 at 5,000. 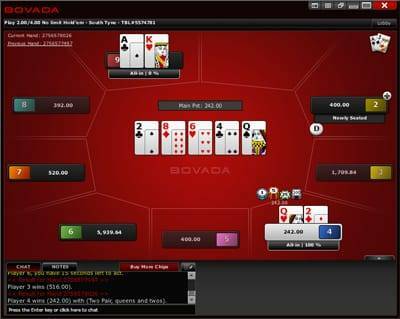 Bovada awards all players Poker Points as they play hands of poker. Note that this currency is different than Rewards Points, which are awarded for sports wagers and casino bets. You earn Poker Points whenever you participate in a ring game or a cash tournament. During a ring game, you’ll earn between 0.05 and one point each time the pot is raked and depending on your contribution to that rake. You generally earn one point per dollar raked. When it comes to tournaments, you receive three points for each dollar spent in tournament fees. For instance, if you entered a tourney with a $50 buy-in and a $5 fee, you’d earn 3 x 5 = 15 Poker Points. Poker Points never expire as long as you remain active, which amounts to logging in. Once you’ve reached 18 months of inactivity across all Bovada services, your points expire and are lost for good. Poker Points at Bovada are used to cover tournament buy-ins and fees. The points you earn are applied to your account immediately, and you can use those points as soon as you have enough. Enough means having the points to cover the total cost of a buy-in and any fees. You can mix and match Poker Points and cash. Any tournament that has a paid buy-in can be accessed with points. In addition, there are some Poker Point-only events, such as a weekly $5K tournament, which have qualifiers you can enter for as little as 25 Poker Points, or you can spend as much as 1,000 for a main seat. Ultimately, if you were only playing tournaments, you would have to spend $1,666.67 in tournament fees to earn the full $500 cash back bonus, which calculates to a 30% rakeback refund, which is a nice return on your poker frees. If you’re enjoying Bovada Poker and want to get your friends in on the action, you can benefit from that referral. Send any friend a direct link to your referral page, or use Facebook and Twitter integration to invite people throughout your network in a more casual, less direct manner. When a friend joins and makes his or her first deposit, you receive a bonus worth 200 percent of that deposit up to $100. That means a friend only need deposit $50 for you to max the bonus out, and there’s no limit to how many times you can claim this bonus. You can use the bonus however you please. If your friend joins and deposits $25 to play slots, you get a $50 bonus that can be used anywhere: poker, casino, sportsbook and so forth. The wagering requirement does depend on how you use the bonus. We’ll focus solely on using it for poker since poker players are who this review is geared toward. 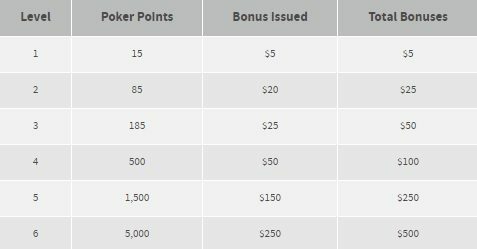 You need to earn six Poker Points per bonus dollar, so 600 PP if your referral gets you the maximum bonus. Below are some of the unique features of the Bovada poker client that sets it apart from most other online poker rooms. Quick seating is an option at Bovada that places you at a cash table with as little fuss as possible. The lobby for this feature is extremely streamlined, and with preferences set, you can get into a game with just two mouse clicks. When you play at Bovada’s anonymous tables, no one knows who you are. You start with a clean slate each time. This is a great feature if you worry about other players zeroing in on your tendencies or just want some privacy. Zone poker is poker played at breakneck speed, and it’s available across any poker formats for which Bovada supports ring games. The goal of this approach is to eliminate as much downtime as possible. As soon as you fold or the hand ends, the system immediately moves you to a new table where the deal is about to happen. The dealing mechanism does wait until the table is full, but with Texas Hold’em, for instance, you’ll never notice. This format is an excellent option when you have a limited amount of time and want to cram in as much poker as possible. Play Texas Holdem at Bovada Poker! Read our review of all the latest Bovada bonus codes here. You can learn more about Bovada Poker at GPSTS.org. I tried playing at ACR and I kept getting kicked out of tournaments - their poker network is constantly getting spammed and attacked, which shuts down all the poker games! It happens constantly. Bovada is much more stable and also has great tournaments so I switched over. Much better! Thanks.